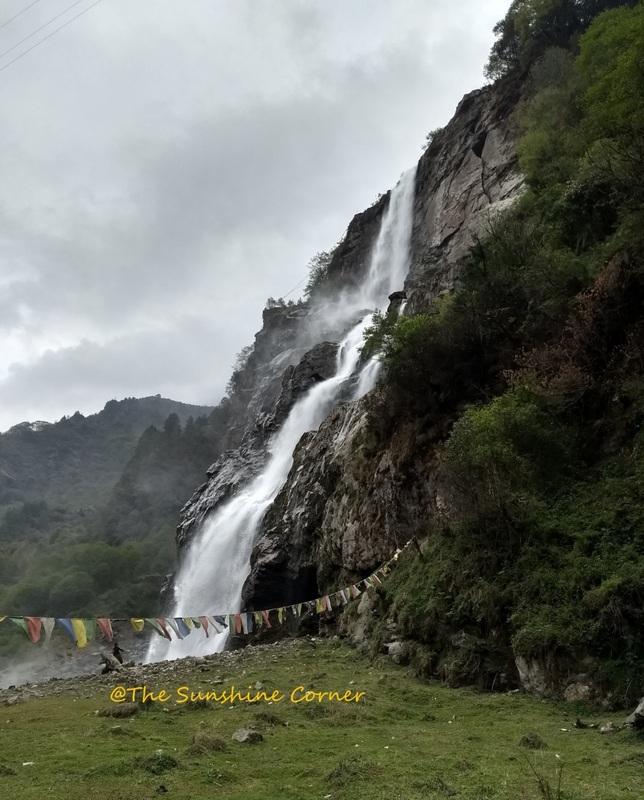 The Tawang trip in the early April of 2018 was a memorable one. We were all set for Tawang, left Dirang town in the morning by car. 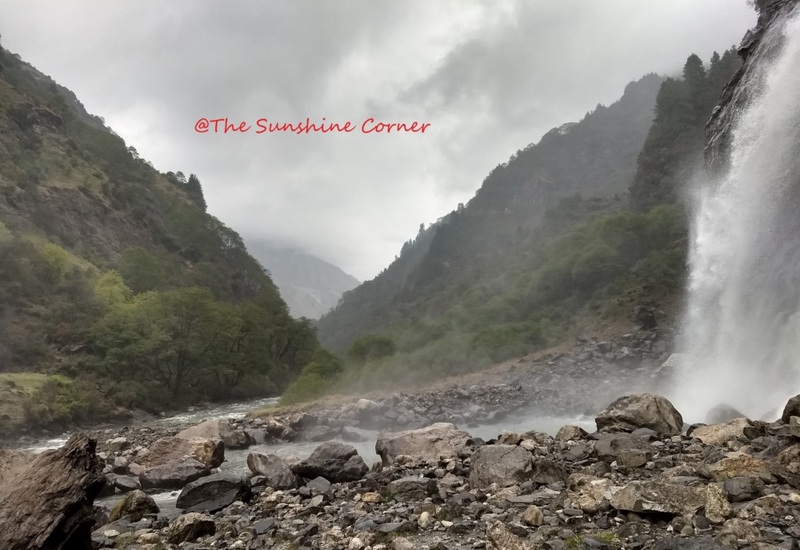 Just after passing the Jung town we get to witness the magnificent Jung falls. This is also known by Madhuri falls as the famous Bollywood actress Madhuri Dixit danced here for her movie Koyla. We weren't aware of this, and after the driver passed this tidbit we immediately checked how the falls looked in the movies. Awesome no doubt even on reels. This fall is known by many names. It's also named after Nuranang who was the accomplice to famous Indian soldier Jaswant Singh in Indo-China war. The hills itself presented the beautiful picture, in between we could see terrace farming, tiny wooden houses. I guess the season has just started. Around early afternoon we arrived at Jung falls. Our driver told us to have leisure time ourselves and said he is going to have small nap. He expected us to have a gala time but it soon started drizzling and later turned to pouring. We can go down to almost to the base of the falls. On the way down to the falls, there is a small hydel power substation which generates power from the waterfall. 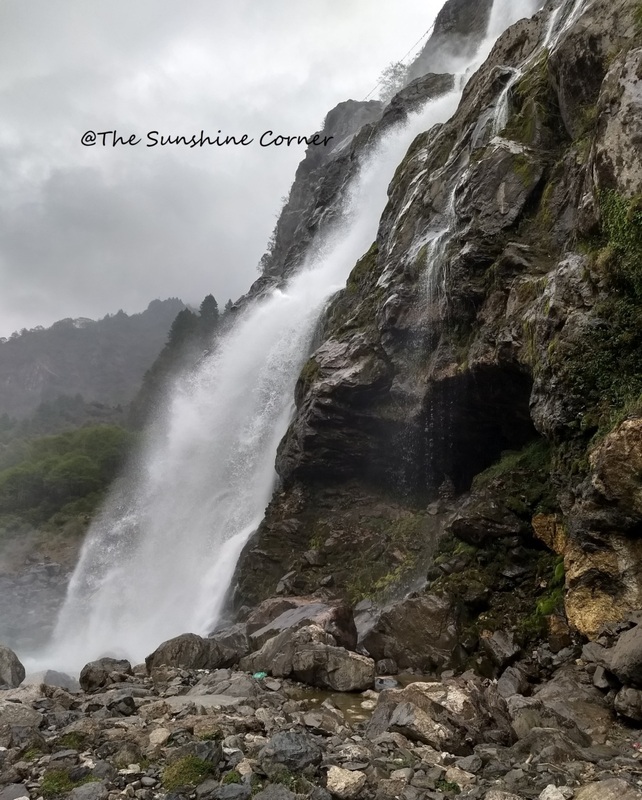 The falls itself is 100 Mts high divided into two levels. During the time we went the river wasn't that deep but the currant was fierce. Since its just the beginning of spring the water was obviously cold. It's picturesque, you get awed by the natures beauty and all you can do is drink all the beauty in front of you. There are no amenities if you are looking for one. Had it not been pouring I would have also danced like Madhuri -:) It's meagerly crowded unlike other tourist spots. It's understandable since beautiful Arunachal is yet to be discovered. If you are residing in the south of Bangalore, do not miss the "Ragi Kana", a unique Sunday market where village products are sold directly to the urban consumers. I first heard about this from my friend and wanted to visit ever since. Last year, same time, I finally paid a visit which was a memorable one. I had taken my kids along with me bribing them about the sweet little things they would get if they accompany me. 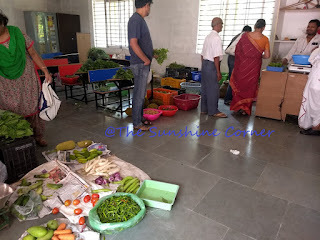 Ragi Kana is held on the premises of Ramakrishna Samagra Shikshana Kendra(a school), off Bannerghatta Road, Bangalore, India. Located among the nature, and bit of fields this would be invisible to the main Bannergahtta road. 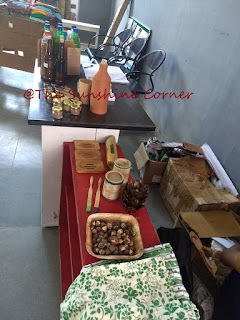 It is a platform where the farmers products are sold to consumers without the presence of the "middle men". First time I visited, organically grown dates from Gauribidanoor, Karnataka were available. I bought these sweet raw dates for the kids without thinking twice and I was also tasting them for the first time. My first visit was followed by many such visits bringing home a lot of organic products, home decor items, Khadi items. Do not expect a big crowd like that we usually see in art and crafts exhibition. Its just few handpicked stalls inside the class rooms of the school. If you are hungry there is always some home made,healthy food at the "millet cafe". Again I am sure you must be visualizing this as some hi-fi cafe in your mind but let me be clear its just a wooden bench and couple of people selling tastiest food items. With every santhe, be sure to witness either the folk performances, film screenings, seminars and workshops for kids and adults. 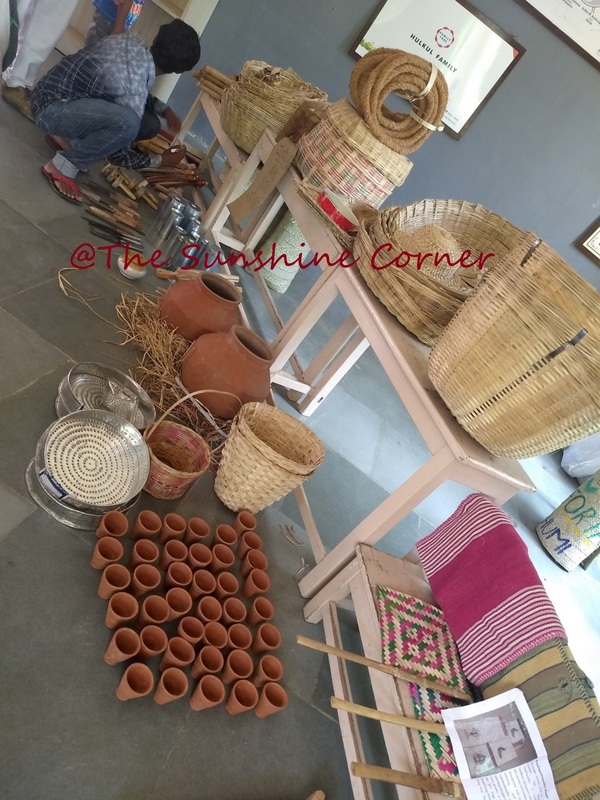 In the month of May where it celebrated its first birthday, I got a chance to attend the talk by "Ravi Kiran" about the process of making Khadi cloth. Listening to him made me realize how difficult it is to gather workforce, raw material and the tough process of making hand made product. If you plan to visit anytime, be an early bird else the the things like vegetables, eatables might get over soon. As a responsible citizen do not forget to carry your own bag. 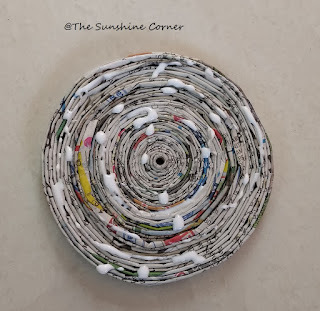 Homemade shampoo, detergent, bamboo brushes.. It's the festive season here in India. 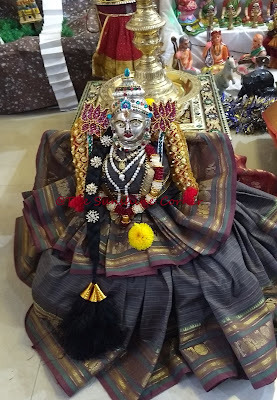 Dussera or Navratri is one which is celebrated all over India, many states celebrating in a different way for nine days, the tenth day being Vijaya Dashami. 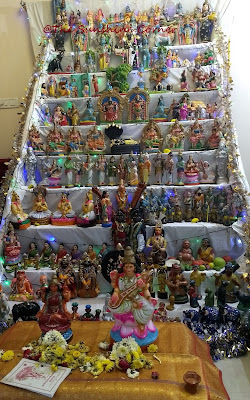 In south it's the Gombe(dolls) Habba or Bommai Kolu(Golu), which is displaying various dolls in a systematic fashion. 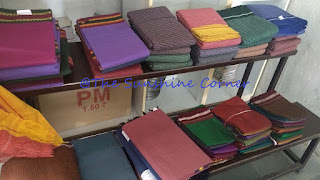 This tradition is popular in the southern states of Andhra, Tamilnadu and Karnataka. 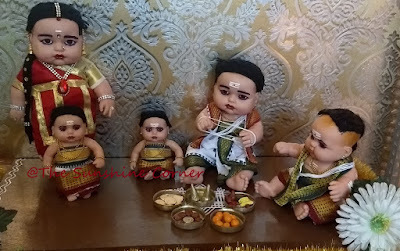 These dolls are kept on the first day of Navaratri beginning with Ganapathi pooja followed by Kalasha Pooja. The female deities Laxmi, Parvati and Saraswati are also kept in front of the rack of dolls. 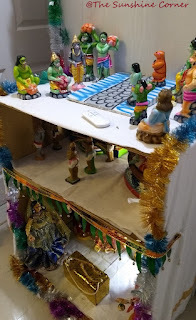 These wooden planks or racks are odd numbered and at times dolls are displayed randomly or they would be arranged according to themes from the Indian epics like Ramayana. 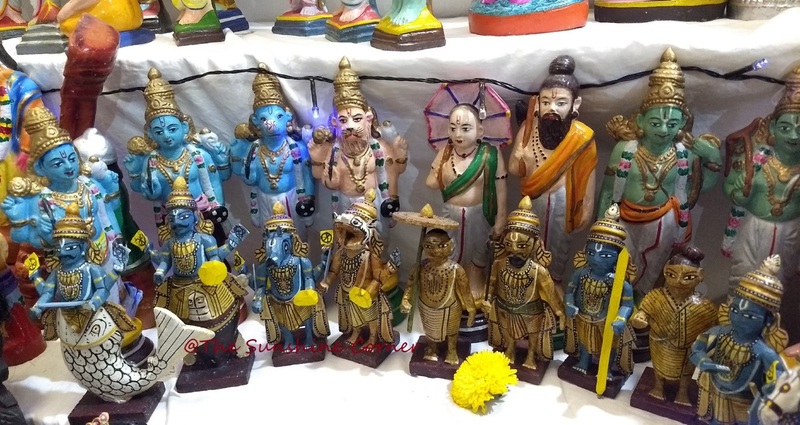 Dashavathara of Vishnu, Kondapalli Wooden Toys. 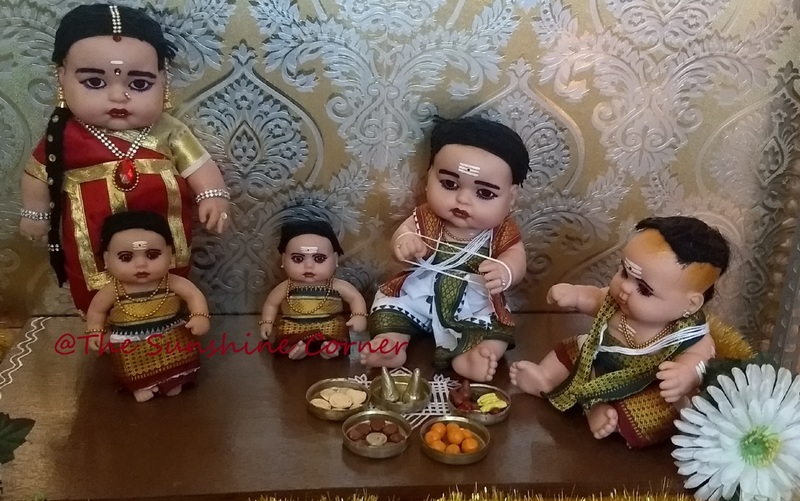 Most of the dolls are made from clay but people also keep hand made dolls, POP dolls and also wooden dolls. 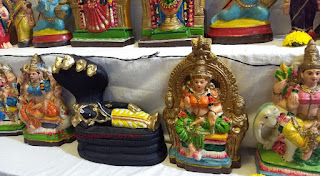 One common doll that we find in the display is the 'Pattada Bombe' or 'Marapachhi'. This is the husband and wife dolls that are gifted to the daughter by the parents during her wedding. 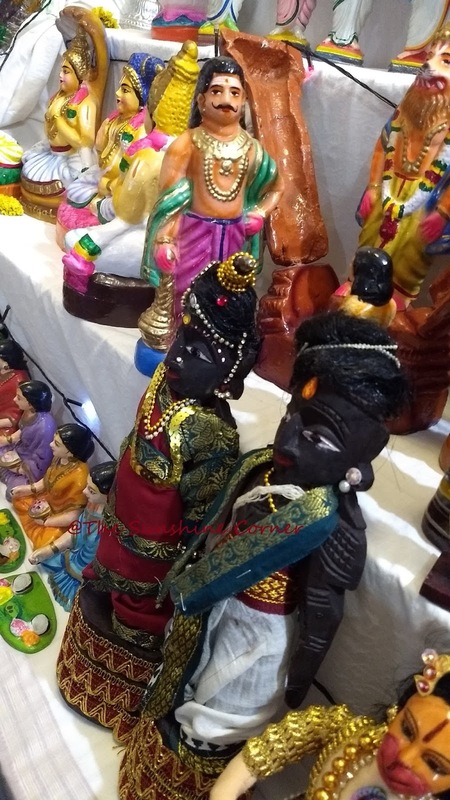 These dolls are usually dressed as the bride and the groom and find the center place in the display. 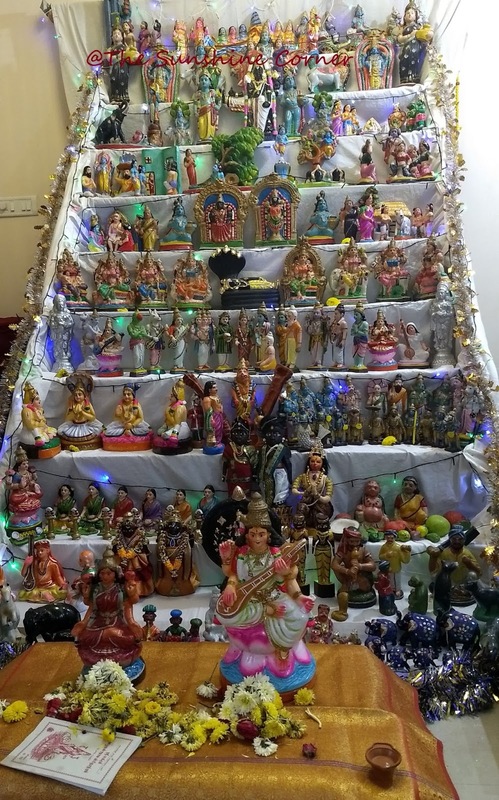 It symbolizes the beginning of daughter's collection of dolls, and continuing the tradition of Gombe Habba. Each evening of the nine days there would be offering(Naivaidya) to the God. 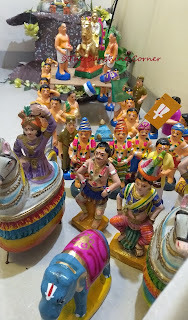 During the evening there is house hopping among the children and the women folk to view the dolls. Many places there would be awards for the best display. The ladies of the community come together for the Arashina Kumkuma where host lady invites other women offering vermilion, sweets, gifts them. 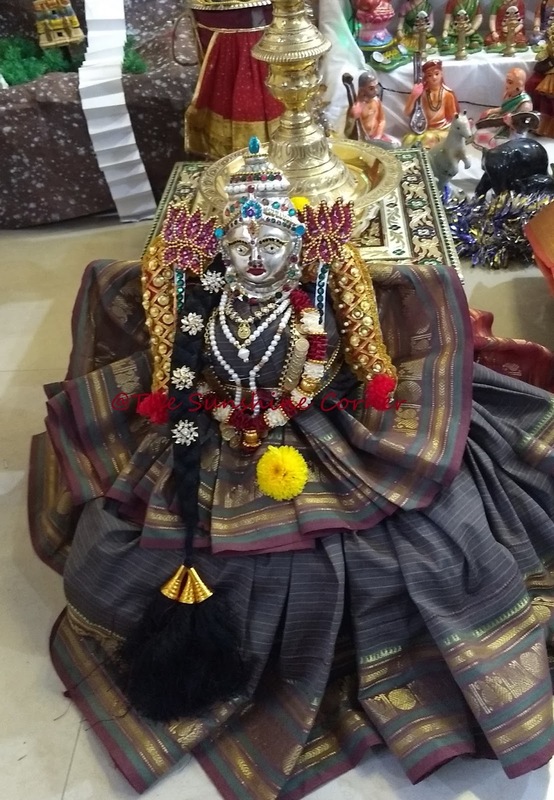 At the end of Navaratri, that is the tenth day, the God is thanked and worshiped for the successful completion of the festival. All the dolls are wrapped up carefully for the next year. This year I got to see many display and it's a visual, colorful treat. One house where I was invited was mind blowing. She has a whole room dedicated to dolls and created various scenes from Ramayana, few mythological scenes. I have been collecting owls from wherever it's affordable and worthy. 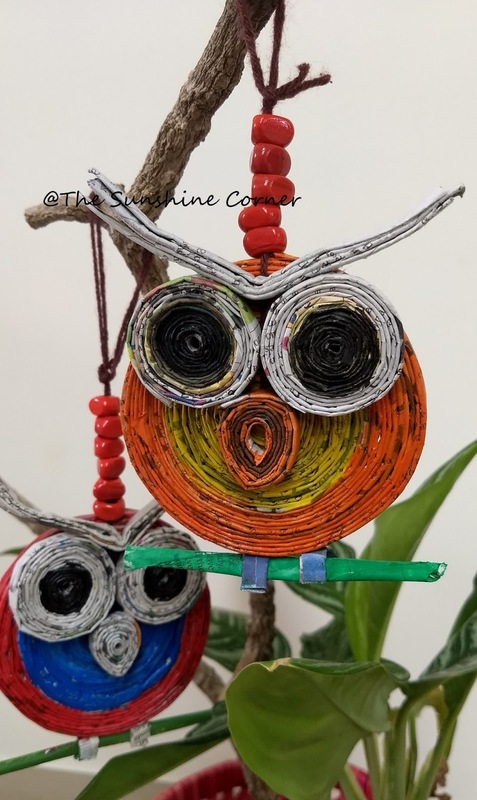 I also found some simple fabric owls and paper owls images online. Thought to try them once. 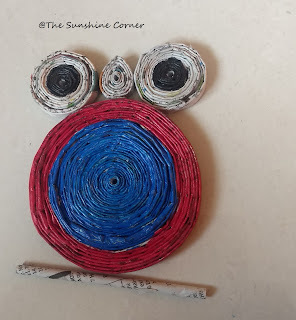 Here is a tutorial on how to make cute owls from the newspaper rolls. 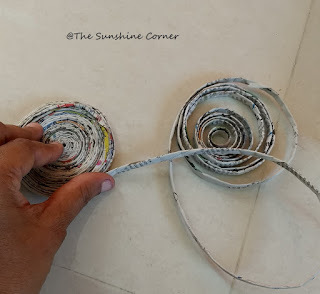 First thing you need to prepare the news paper rolls. You need few of them and take the best ones. In spite of doing newspaper rolls, I am still not achieved that perfection yet. Many which I make are not the same from top to bottom. I always find helpful in flattening them first, make a rough roll and then use it. You need to make a fair roll of at least diameter of 9 cm. 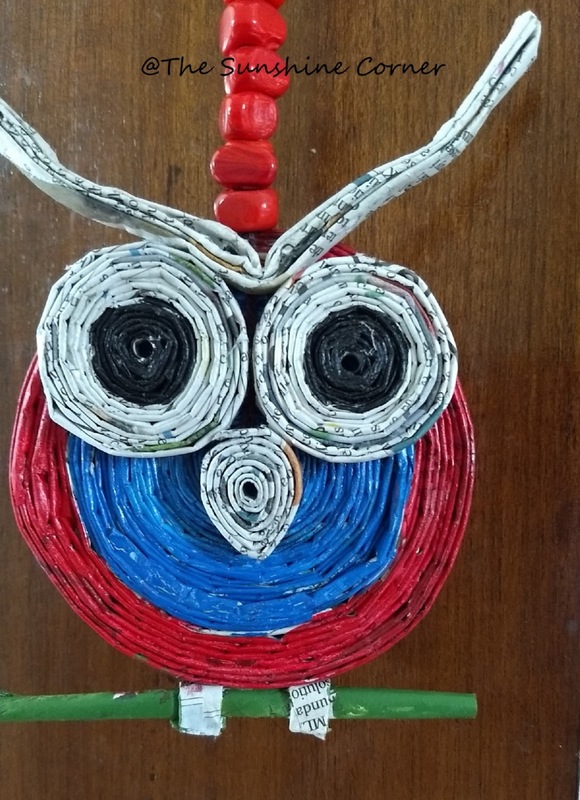 Apply generous amount of glue on both sides of the base body of the owl. Meanwhile prepare two rolls of diameter 4 cm for the eyes. Coloring is optional. I don't like a thick acrylic layer on the owl, so I used the thin coat of acrylic on the base. I love the effect of newspaper print and colors. 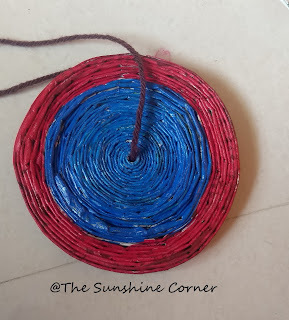 If you are planning to make a hanging then put sufficient length of thread from the middle hole and tie it at the rim. After everything has dried, colored, attach the eyes to the base body,on top. 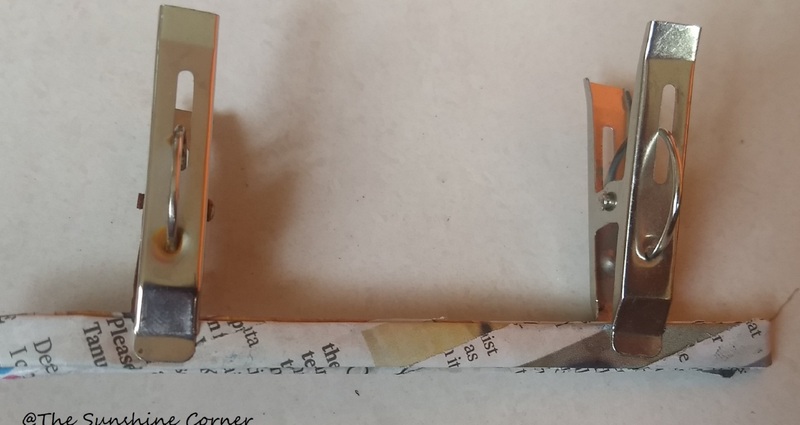 For the head, a made a thin strip of roll which can be flexible. It can be easily bent and can be attached on a top of the eyes. I also made a branch at the base. 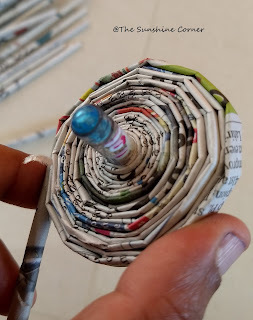 You can make few of them and make a Garland or use it the way I have used. I have put few glass beads and hung them on an indoor plant and one on the knob of the door. It's always a crafter's dilemma as which craft to do first. I am also one such case who is shifting between one craft to another, abandoning the thing in between. I had bought a pack of glass colors with a plan to color the glass bottle, obtaining a tinted bottle. I abandoned this after not getting the expected results. After a few months again I bought a pack, this time of another brand, left it unused for many days. Few days back I saw my relative using the glass colors to make a beautiful glass painting. I got so inspired from her and try a simple one on my own. So here a simplest way in which you can use the glass colors. I took two drinking plain glasses. Cleaned it first and let it dry. I took Camel glass colors, Water based, which comes in a pack of six colors and a black liner. Drew the desired design using the glass pencil. This is optional. If you are confident enough, you could do free hand directly with the liner. With the liner that comes with the pack, drew lines, on already sketched design. I drew multiple diamonds around the curved surface of the glass. Let it dry completely for about an hour. I filled in these diamonds with the desired colors, one diamond at a time. The liner acts as a boundary and will not let the color spill to the next cell. 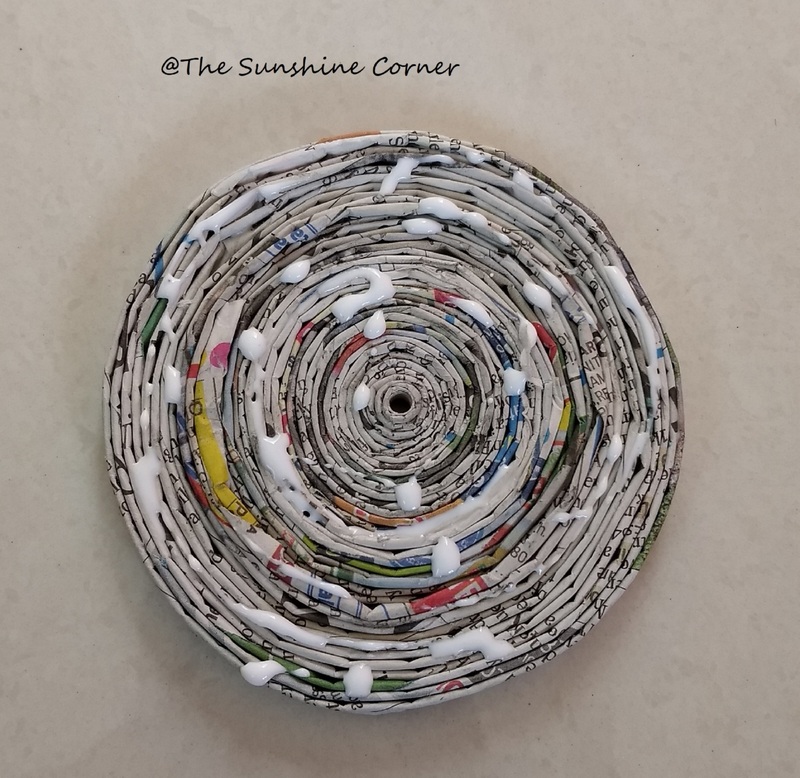 Since it was a curved surface, I had to fill each one and wait till it dried completely.While drying it again I had to lay it flat. Since glass colors run crazily, it would get concentrated at one place, look plain in some places. Its OK for the first time and its OK because making the paint stay on a curved place is not easy. But in spite of all these minor glitches the finished piece looked cute. I used my terrace space for drying. It was sunny and was good for my project. This way the paint dried quickly and I could fill in each color quickly. If you are looking for a weekend getaway from Bangalore, Mysore is one of the place most of us choose. There are lot of things to do in Mysore which is calm, peaceful and pensioners paradise. Last weekend we visited sister in law place in Mysore. Kids were demanding trip to either the Zoo or Palace. Having seen them many times, we definitely weren't in a mood to go there. 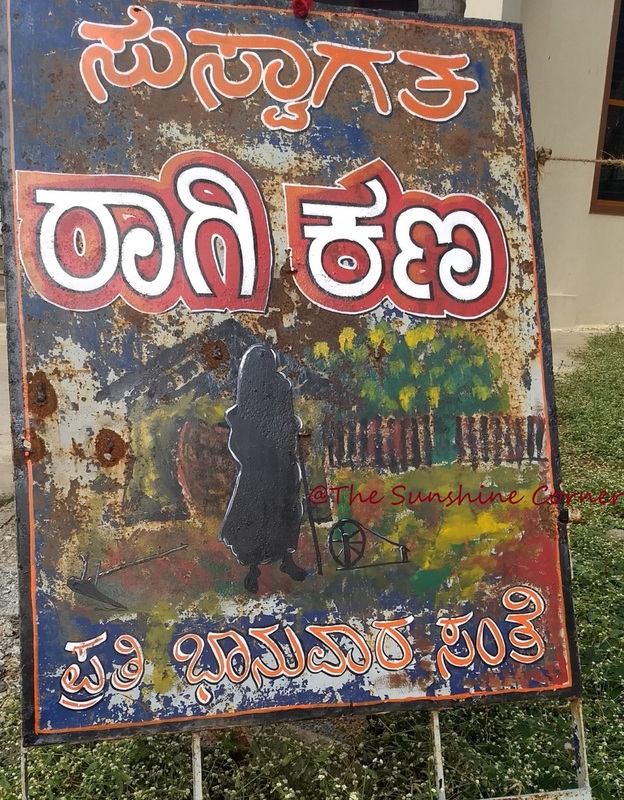 While contemplating a new place to visit, we decided to go to to Avadhoota Datta Peetam situated on the foothillls of Chamundi Hills. The Avadoota Datta Peetam or Sri Ganapathi Sachchidananda Ashrama , as it is popularly known, is not any typical ashrama. The Ashrama, spread over a few acres, houses a Bonsai garden, lots of beautiful sculptures, a massive bird cage, a temple, prayer hall, vintage cars, a park, large Hanuman Statue and many more. Founded by His Holiness Sri Ganapathy Sachchidananda Swamiji, Avadhoota Datta Peetham is a world-renowned institution for the social, moral, cultural and spiritual welfare of mankind. You need at least a day, if you want to explore the whole of Ashram. Our visit was worth, since it caters to everyone's desires. 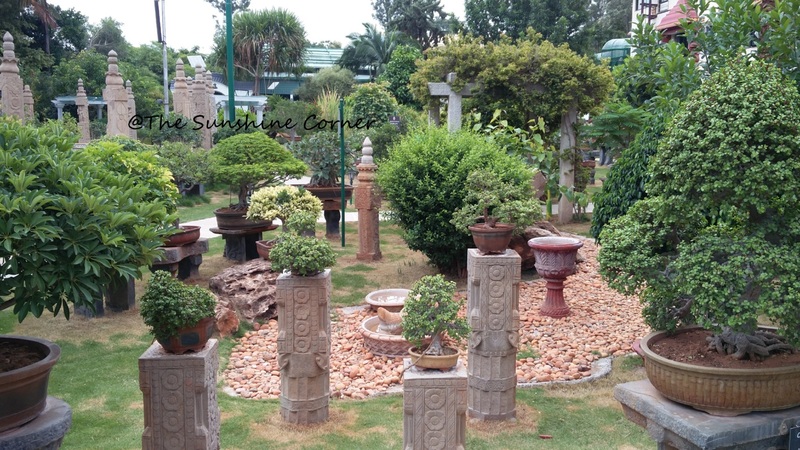 It has a museum for museum lovers(which we skipped due to priorities and time), Shuka Vana, a bird aviary and a Bonsai garden for garden lovers. Apart from these it also has large statue of Lord Hanuman, Nada Peetham and Dattatreya Temple for the spirituals. The Shukha Vana bird aviary encompasses more than 568 species of birds mainly parrots, macaws, horn bills etc most of them from the tropical countries either rescued or bought. Entry is free to the Shuka Vana. Apart from beautiful birds, another major attraction of this aviary is feeding the birds at a nominal cost and getting clicked with them. I wouldn't recommend the taking photos with Macaws as it is slightly overpriced and the staff are rude. The use of mobile phones is strictly prohibited inside the aviary. The birds are enclosed in cages which is well maintained and taken care of. At the end of the day, I think a few of them are let free in an enclosure. Some of the cockatoos are very adept at mimicking what you say and it was so fun. My son was busy talking with it, seeing it talking back all of us were talking it with, and finally it got confused whom to mimic. 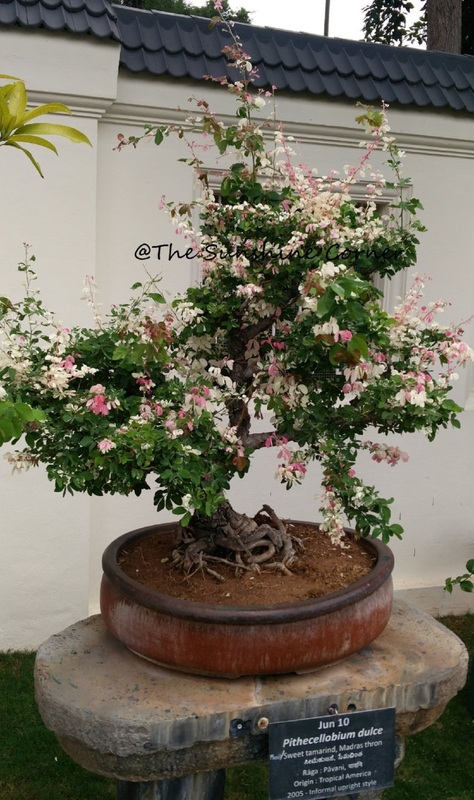 The jewel in the crown was the Kishkinda Moolika Bonsai garden. 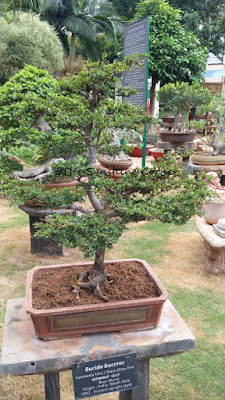 The entry to Bonsai Garden costs you rs 20, and its just awesome and very well maintained. Here you can see lots of Bonsai, one for each day of the year. Also these Bonsai's are kept with the name of the raaga. I have never been to Bonsai garden before and I was left stunned and thoroughly impressed by this collection. Both Shuka Vana and the Bonsai garden are the award winning projects of Swamiji. If you plan to stay or visit Mysore, Karnataka, don't forget to add this in your Must Visit list. Living close to nature has been a boon to us. My morning walk is never complete without observing the minute details of the nature. There are lots of trees near our house which bear beautiful flowers. These flowers make their way to my home, as well as their dried version. Here are some ways in which I have incorporated them into my home decor. Sandpaper vine is most beautiful while in bloom, but dried version is also glorious. I picked up an entire dried twig. Isn't it looking gorgeous? These flowers in an abstract vase and with yellow background looks good in my home. The pods of "Pride of India" which are beautiful in their own way. I get different ones each time, half closed, closed and fully open ones. 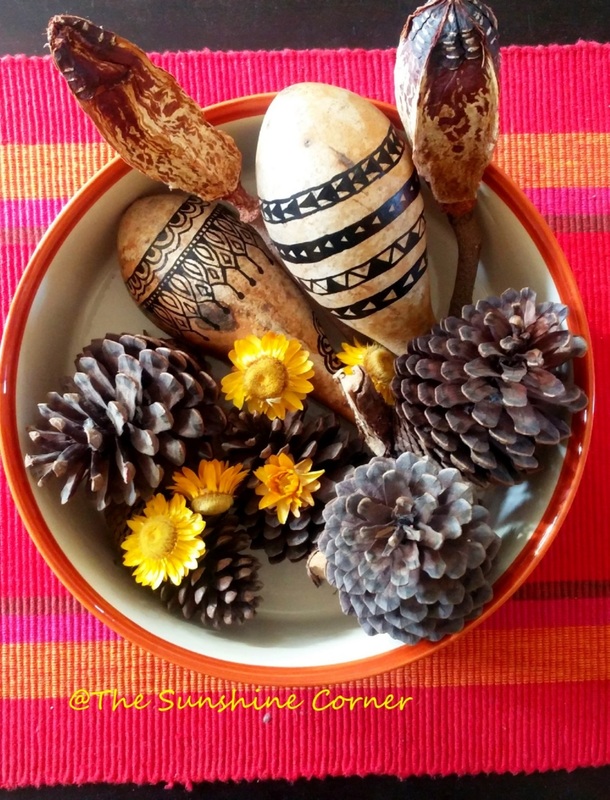 These are brown ones which goes well with any kind of vase either plain ones or designed ones. These were few dried wild pumpkin that I picked up on our home from a road trip. They were plain and I could not resist the idea of doodling on them. In this vignette you can also see the pods, the ever blooming dried flower famous in Ooty, India and also some pine cones that we purchased in Ooty. 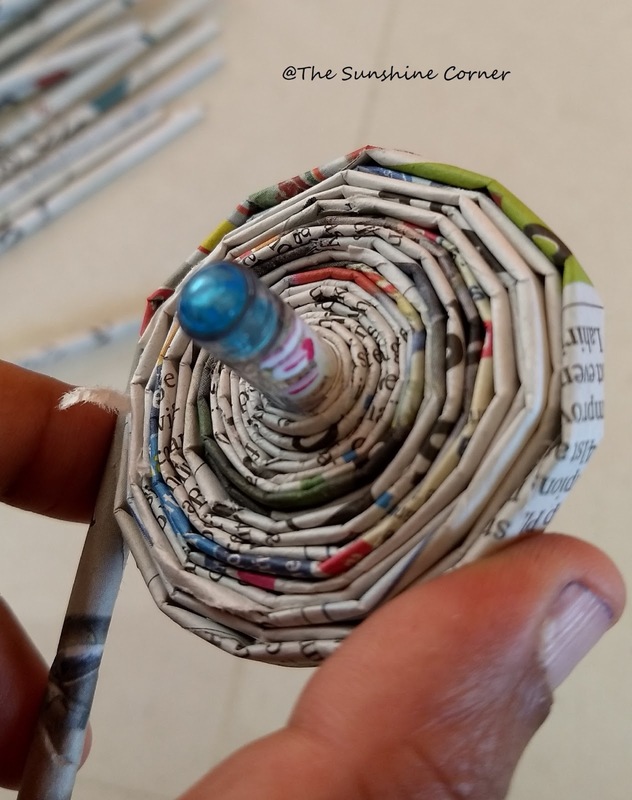 If it's India you are sure to spot the May flower or Gulmohar as they are popularly called.While their flowers are irresistible, their pods are also good item for testing your painting skills. 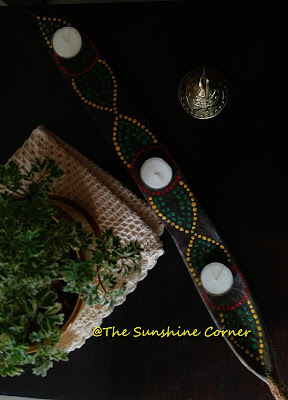 Besides making a simple tea light holder from this, these are popular in my home for the fake sword fighting among my kids. Some wild grass that I picked up on a day of hot summer. Note that these were already dried due to summer heat and I didn't have to put any effort in drying them. And finally, my favorite vignette at home on the coffee table. I randomly put some twigs in tinted glass jars. So next time if you come across something like these, be sure to pick them. Turn them to affordable decor piece.